Alexis Bledel hit the red carpet this evening(January 7th) for the 75th Golden Globe Awards at The Beverly Hilton in Beverly Hills, CA. 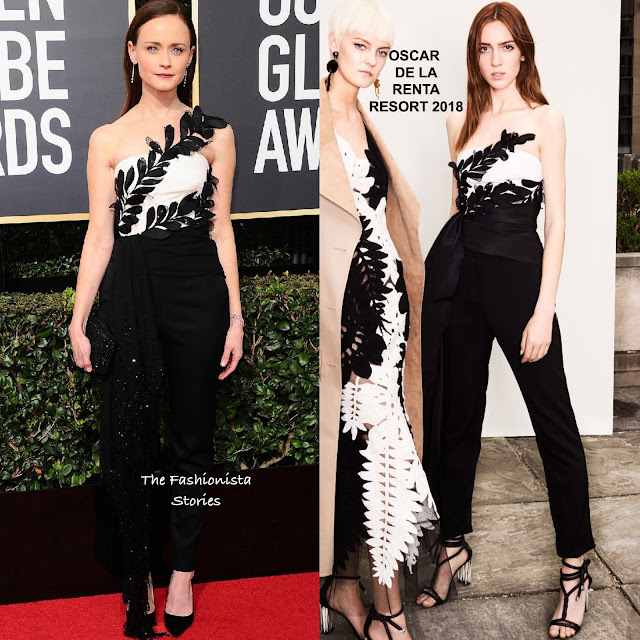 For the occasion, she wore a OSCAR DE LA RENTA RESORT 2018 strapless jumpsuit which featured a white top, black ankle length trousers, a leaf embroidery across the bodice and a satin & beaded waist sash. Alexis jumpsuit is slightly different from the look book version but either way, she nailed this look. To ensure that nothing takes away from her look. she wore her straight & off-the-shoulder. A colored lip and a black clutch & pumps finished up her look.